We tried to automate most of the things for you, but still there are situations that require some undrestanding. Check below. What are the two EXT ports for? The extension (EXT1 and EXT2) ports allow you to connect optional accessories, such as GROM Bluetooth Dongle, GROM Auxiliary 3.5mm harness, or HD Radio Dongle. 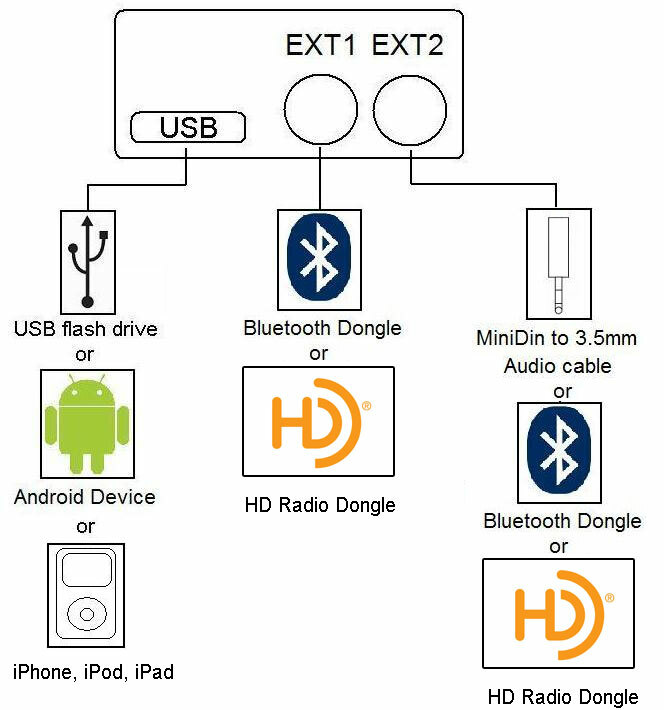 How do I switch between USB and EXT ports (AUX/Bluetooth/HD Radio)? There is no need to switch to Bluetooth. As long as Bluetooth connection is active, such as phone call comes in, or the music streaming is on, it will override currently playing mode (USB/AUX/HD radio). 1. Press FM (or AM), wait for 1 second. 2. Press CD/MODE/DISC (to access GROM mode). You should hear announce of the currently active mode. 3. Immediately press > (next track button). If HD Radio Dongle is not present the GROM will skip "RADIO" mode and will announce "AUX" right after "USB"
Refer to the video on how to switch the Modes on GROM-USB or GROM-MST4 device for better understanding. To use Bluetooth, does GROM need to be in the AUX mode? No, it does not matter what mode is GROM in. As soon as Bluetooth is used (such as for hands free phone call or wireless audio), it will override any previously active mode. How many root folders/virtual playlists I can set up on my USB stick? You can set up up to 6 folders/virtual playlists. We recommend using smaller drives with manageable number of folders ~20 and change them. GROM will remember 4 sticks and will be able to restore all positions in up to 20 folders for them all. How many files per root folder (playlist)? We have tested with ~1000 files in a playlist. So technically no limits but be aware that it might take longer to switch between tracks and proper track ordering may not be possible. What formats/bitrates it supports ? What limits does GROM-MST4 have? Can GROM-MST4 power up my portable HDD? Can GROM-MST4 charge my iPhone or Android phone? How can I connect iPod/iPhone/iPad to GROM-MST4 system? iPod/iPhone/iPad can be connected using standard USB to iPhone cable. The GROM supports Lightning style and 30-pin connector style cables. You can also connect your iPod/iPhone/iPad using GROM AUX and 5V USB charging cable Check our store or add to your cart along with GROM-MST4 module. You can also connect your iPod/iPhone/iPad using GROM Bluetooth Dongle for wireless music streaming and hands free phone calls. Check our store or add to your cart along with GROM-MST4 module. How many tracks device support? Should I name folders in certain way and place all files into the same folder ? No. We do not recommend using 1 directory for all your files. It will make it hard to preserve the file sequence. Folder "01-Mine" will be mapped to the first DISK and all files inside directory "Extreme Behavior" will play in ascending order (01, 02, 03 etc) and will not mix up with any other album. I see that device supports CONFIG file. What is it ? Make sure that you are in correct mode. You can connect the aux cable into EXT1 or EXT2. If you connected the aux cable into EXT1, your GROM should be in the AUX mode. If you connected the aux cable into the EXT2 port, the GROM should be in the iPod mode. You can use formats like: "01." or "01-" or "01 "
Make sure that tracks have no gaps in numbering. And either all tracks have numbers or none. 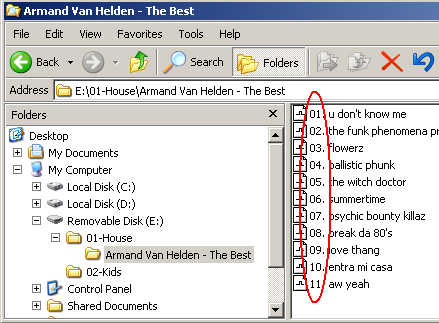 In example below the underlined track will not play and the circled one will play twice (as 2nd and 4th). 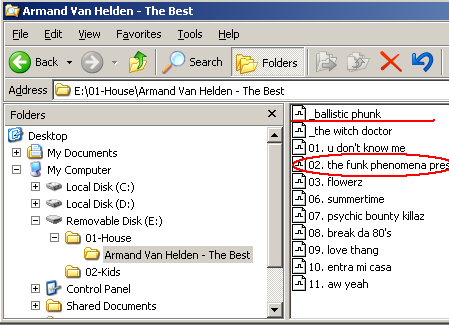 If you need folders to be assigned to a particular disk, they have to be named as shown below. Make sure root folders (playlists) are named in latin characters with no spaces in names ! If you do not have any issues with the unit do NOT update ! - Turn on ignition and switch over to GROM (SAT/CD changer) ! It is normal when the other end of AUX cable is _not_ connected to anything. Once iPod or MP3 player connected there will be no noise or whine. If noise still present after the audio source is connected then contact Technical support. 832-12-****** units: To check firmware version switch to USB mode. Remove USB stick. The track number will show build number. Please note: Build number displayed will NOT match the firmware version that is displayed on download page. So in order to see if firmware changed do this operation before and after update ! 834-13-****** units: To check firmware version switch to USB mode. Remove USB stick. The track number will show VERSION number. 2. 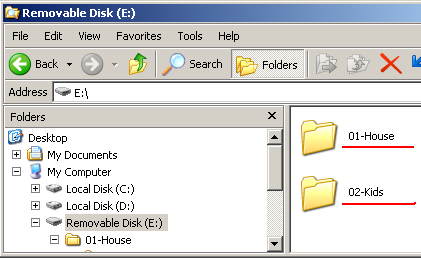 Press CD/MODE/DISC. You should hear announce. 5. Wait for 2 seconds for USB to start playing. Make sure the USB stick is formatted with FAT32. Use full format in Windows desired. Make sure all tags are ASCII encoded. Some tools like Windows Media Player use Unicode which makes it unreadable on most stereos. If the version of your Android software is 2.3 and newer, you will need to have USB Debugging disabled (off) to allow AALinQ to communicate between your Android and the GROM-USB2P. If the version of your Android software is older than 2.3, you will need to enable USB Debugging function on your phone. USB Audio streaming (without AALinQ) is supported as long as Android phone is running Android 4.1 and above. Most but not all Android 4.1+ phone support USB streaming due to the way some phone companies leaving this feature out in their version of Android. You will have to enable USB streaming using a config file. Check the instructions on the forum. Please note that with the USB streaming config file loaded AALinQ will work just like other applications with no track control or song info. If you would like to re-enable the AAlinQ controls and text, you will have to either reset the GROM unit by pulling white connector to disconnect power from it or load another config file to turn it back on which would be config file with gromusb2.cfg with a= 1 instead. Known limitations are: HTC phones are not supporting USB Audio streaming. Other phones, including Samsung and Nexus Android phones, do support USB streaming. Can I activate iPhone Siri voice control? You can activate Siri voice control by pressing Scan button twice. Please note that your phone should not be in Bluetooth audio streaming mode. Now the pairing is done and after each ignition start your phone will automatically connect to GROM-CAR! Does bluetooth remember multiple devices? How does it auto connect to one when the car is turned on? The GROM Bluetooth is capable of pairing up to only 2 devices at a time. It can only connect to one Paired device at a time. It will auto connect to the phone that is nearby when the vehicle is started. The car came with Bluetooth phone capability but no streaming audio capability. If I hook up the GROM Bluetooth can I use it for the A2DP streaming only, and use the car Bluetooth for hands free calls? If you have newer smartphone, you should be able to select which paired device will handle phone calls and which will handle music streaming. This is all typically done from the phone Bluetooth settings, and available in iPhone and Android phones. The phone and GROM syncs at times and on other occasions it will not stream audio. After first turning on stereo/GROM please give the GROM 10-15 seconds to fully sync with bluetooth before hitting play on device. My phone is connected to GROM Bluetooth, but there is no sound coming from the speakers. Make sure that the Bluetooth volume is turned on and all the way up.